Nearly 11 months after Hurricane Maria, 100 percent of the customers that lost power due to the storm have access to the grid as they now have electricity. 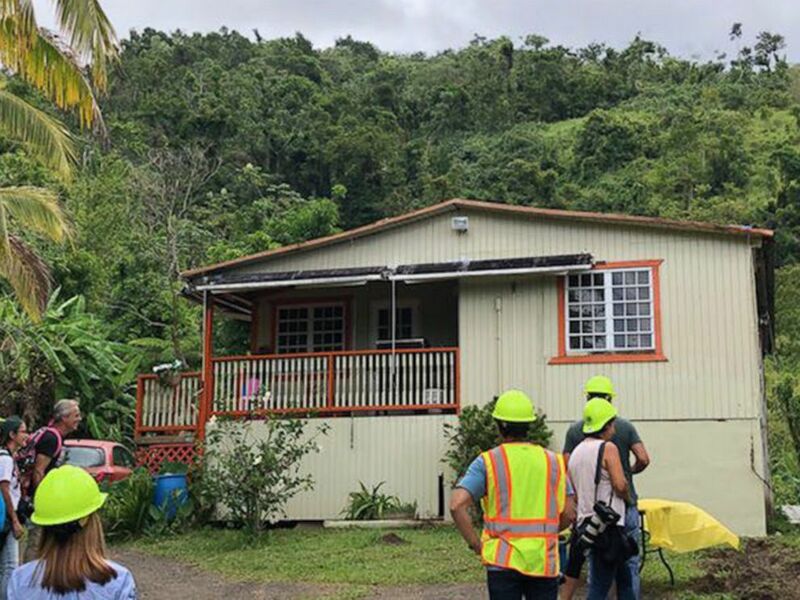 The Puerto Rico Electric Power Authority (PREPA) confirmed to ABC News that two families in the mountainous area of Ponce were the final customers brought back online. The bankrupt utility company said Tuesday that today represents the end of the restoration of power to customers that are able to get power. PREPA says that the homes of customers with damaged or destroyed means of getting electricity will have to call the company after they make the necessary fixes to get power again. There's an unannounced number of customers without power living in El Yunque rainforest, and PREPA's waiting for the Forest Service to approve the installation of energy poles, the company said. It has been 328 days since Hurricane Maria made landfall on the island as a category 4 storm, plunging the island into darkness, decimating the electrical grid, causing nearly $140 billion in damage and claiming countless lives. And, despite the good news, blackouts and brownouts are a part of daily life on the island. Workers stand outside one of the two homes that had power restored on Aug. 14, 2018, after a mission by the Puerto Rico Electric Power Authority in Ponce. PREPA engineer Carlos Alvarado detailed to ABC News the complexity of Tuesday's operation. "We spent more than two weeks working to make roads with excavators bringing and raising electrical poles, doing all the preparation," Alvarado said. "And, today, the aerial operations unit to bring electrical cables." The wires were connected to the generator that delivered power to the homes of the two families. The two families reside in Ponce’s mountainous Barrio Real Anon. One of the families would go to a relative’s home in the evenings and then back to their home during the day, according to Alvarado. He said the families were emotional when the power came back. 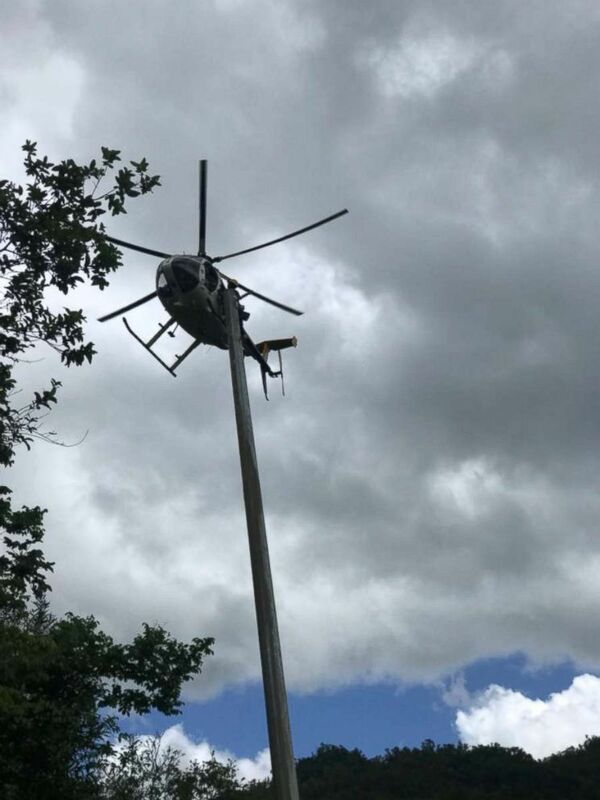 A helicopter participates in the operation to restore power to two homes in the Puerto Rican municipality Ponce. PREPA has faced recent organizational turmoil with two CEOs resigning in the same number of weeks after a storm of controversy surrounding the salary of one of the CEOs. In June, then-PREPA CEO Walter Higgins told The Associated Press that it would take an additional two months for the organization to restore power to 100 percent of its customers. The island entered the Atlantic hurricane season with 10,200 people without power. In a statement to ABC News, the Federal Emergency Management Agency (FEMA) called Tuesday "an important milestone" for the island's recovery but acknowledged there's a lot of work to do. 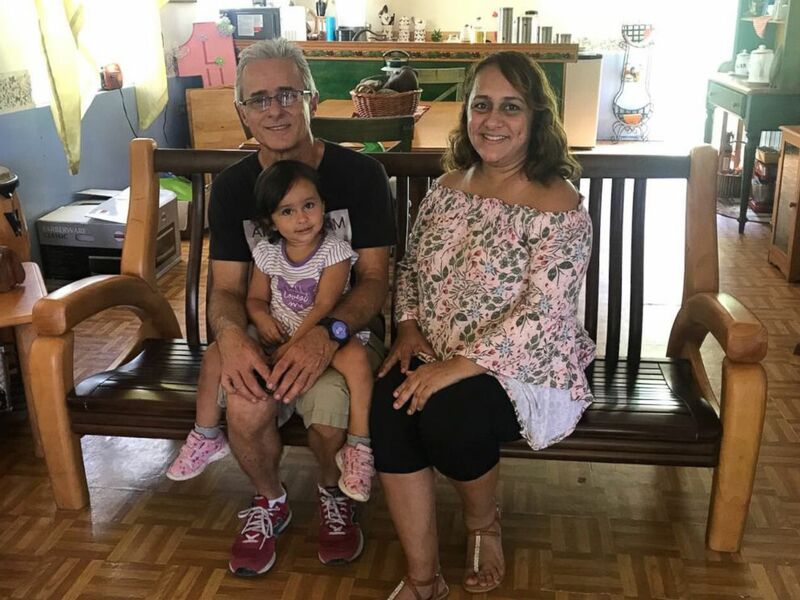 Jazmin Mendez and her family, pictured in an undated handout photo, were one of the last two customers to get power after losing it during Hurricane Maria. "FEMA, its federal partners and the government of Puerto Rico are undertaking one of the largest post-disaster reconstruction efforts in U.S. history," Juan A. Rosado-Reynes, a FEMA spokesperson, said. "Today, electricity is flowing, water systems are operating, traffic is moving, airports and seaports are operating and permanent reconstruction has already begun." FEMA has disbursed a total of $2.1 billion in mission assignments to the U.S. Army Corps of Engineers for emergency power restoration efforts and a total of $1.19 billion in public assistance grants to PREPA for grid restoration expenses. In mid-October, Puerto Rico Gov. Ricardo Rossello announced a benchmark of Dec. 15 to reach 95 percent of electricity distribution on the island. ABC News has reached out to Rossello for comment on Tuesday's restoration and will update this story when we hear back. This milestone in Puerto Rico marks the end of the longest blackout in American history.